Iron ore is the top performing commodity so far in 2016. Yes, that’s not a misprint. It’s a statistic few would have thought possible, let alone plausible, given the raft of negative headwinds that saw prices plunge by close to 80% from the highs seen in 2011. Like Lazarus being raised from the dead, iron ore staged a spectacular rally from the depths seen in mid-December last year, leaving it up more than 40% from the start of 2016. As a result, it currently tops the commodity price leader board for the year, beating out the likes of silver, zinc, thermal coal and crude oil for the mantle, at least right now. The chart below from Citibank has the current rankings. Analysts from Citi, like many others, are surprised at the current state of the leader board. “Given the abundance of easy to find and cheap iron ore and coal, no one could have predicted that the bulks would be generating among the best returns not just for this quarter but year-to-date as well,” they wrote in a note released earlier this week. After such a strong run for commodities since the first quarter of the year, predominantly in bulks, energy and precious metals, the question now is whether this is the start of a longer lasting upswing for prices or merely a false dawn before a renewed bout of weakness. To Citi, it will come down to the strength of the global economy. And central to that, in its opinion, will be the performance of emerging market economies. “Can Brazil, Russia, and other commodity producers put recession behind them and will Australia, Canada and other commodity countries sustain their recoveries? As with the advanced economies, that sustainability for commodity producers is also critical in turn for global trade and global growth and ultimately for global commodity demand,” it says. 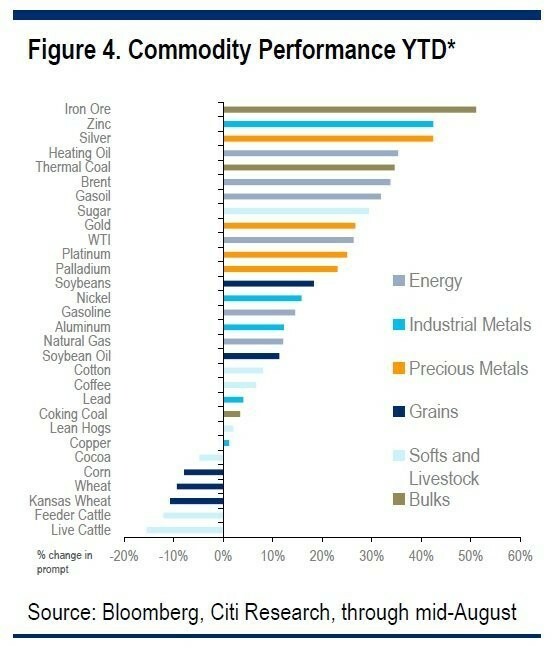 As the largest consumer of commodities globally, Citi says that “China remains the fulcrum of the commodity price recovery”, suggesting “its extraordinary import growth this year is singlehandedly responsible for the outperformance of iron ore, thermal and coking coal”. On that front, the bank is not overly optimistic that trend will continue, especially with several leading economic indicators pointing to sluggish growth in the second half of the year. “Tumbling corporate bank loans, rising demand deposits, and decelerating manufacturing fixed asset investments all point to Chinese corporates’ unwillingness to invest further, suggesting a bigger slowdown ahead,” it says. “And the commodity import surge could well continue for a while, some of it a form of capital flight via over-invoicing on the import side.